Tonight I have a Birthday Card that I made today. 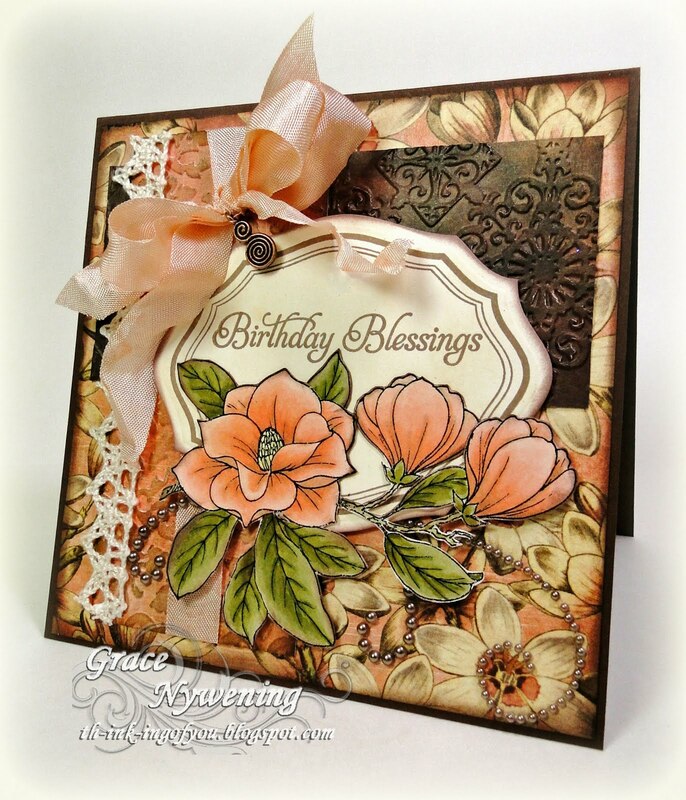 I used Our Daily Bread designs' Happy Birthday set for the sentiment, and the new release stamp set, Eternity for the frame, along with the Custom Die Cut made exclusively for ODBD by Spellbinders, Label 1. I also used the Magnolia image by Just Inklined that was included in the Help for Katie digis given as a gift for all who donated to help fellow stamper Katie Renz. While that particular drive is over, you can still help dear Katie out as she battles stage 4 stomach cancer HERE. I used this week's sketch from BasicGrey Challenges turned on it's side for my layout. The base is Papertrey and the designer paper is BasicGrey Curio. The die cut and matching frame stamp are from ODBD (Eternity Set, just released Mar. 1). I stamped in Memento Rich Cocoa and sponged with THoltz Antique Linen all over the vanilla cs. I sponged the edges with Memento. I printed out the Magnolia image on Georgia Pacific White and colored with Copics, then cut out and sponged the edges with Memento to antique it a bit. I popped up the label and flower. I dyed the seam binding using Alcohol Inks in Shell Pink, Terra Cotta and Caramel, along with some Blending Solution. I used 2 CB folders for the texture and sponged them as well. I added some pretty lace that was a gift from my sweet friend Sabrina. The pearls are ZVA Creative, the charm is from my stash. GORGEOUS card Grace!! Oh, there's that beautiful paper again! I looked for it on my last visit to Michael's but they didn't have it :( LOL! God telling me I didn't "need" it I suppose. But I sure love seeing it on your creations! Hope you're having a blessed week! =) HUGs! Gorgeous card Grace. That paper is some of my favorite. I love the die shape. It is fun to have the shapes that coordinate with your stamps. We are all healthy here. I hope it stays that way. I never really got sick other than one day. Maybe allergies. See you soon. Hope your week with Lauren has been fun. Oh my word this is absolutely BREATHTAKING!!! LOVE these colors Grace!! Your card is just beautiful! I love the combination of colors and textures. Thanks for playing along with our Sentiments challenge. Wow Grace!! This is stunning my friend!! I just love the Curio paper with those beautifully colored Magnolias!! The color combo, details, and design are gorgeous!! Wowzer!! Oh my Grace!!! This is so beautiful!!!! That paper is gorgeous as is the seam binding! You dyed it a beautiful color!!! OH MY Goodness Grace, this is just stunning my sister! Those flowers are gorgeous and the design paper is just perfect with this. I lurve the card you made with our digi stamp, thank you so much for letting me see your card. Oh my goodness, Grace this is gorgeous! WOW! This is just lovely! You worked with a beautiful color palatte and your flowers are colored perfectly. Thank you for playing along with the Desert Islands Crafters Challenge! Congratulations! You have won the Card of the Week over at the He IS Able blog! Your card should be arriving during the beginning of next week! Enjoy! And, your card is incredible! I love the coloring of the images. That paper is gorgeous, too. I can't find it locally. I will have to see if ODBD sells it! I love the dark colored embossing, and the beautiful lace and ribbon. When it comes to ribbon--you sure know what you are doing! This is beautiful! Gorgeous card Grace. It's been a while. Thank you for your lovely comment on my blog today - it's so appreciated. Wowzers, Grace, this is GORGEOUS!! I've been hoarding that paper, but you've inpsired me to use that digi with it! Thankd for playing along at Stamps R Us challenges. This is just beautiful! Thanks for playing along with us at Paper Playtime. Gorgeous card love every element. Thank you for entering out blog hop - Good luck. This is absolutely gorgeous, Grace! I love the DP and embellishments and the beautiful Magnolia! Wonderful coloring and design! Looking forward to seeing you next week! Hugs! Oh Grace what an absolutely stunning card! WOW!!! 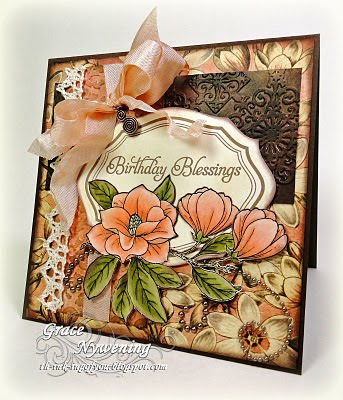 I love the beautiful BG Curio papers you have used and the peach and brown is such a scrumptious colour combo! The embossing is gorgeous and adds so much texture and beauty and the floral image is stunning too! Love the luscious seam binding bow! Thanks so much for joining us at BasicGrey Challenges! This card is sensational. I love how you have chosen the DP to work so perfectly with your flowers. Coloring is exceptional. Love the soothing colors on this Grace- I agree with Lori - extreme beauty! Oh what an adorable card, love the flowers. Thanks for joining us at EAC this week. Wow, this is absolutely beautiful! Thanks for playing along with us over at Desert Island Crafters! !